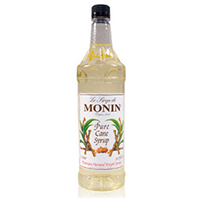 Monin is proud to offer pure cane syrup; a premium simple syrup made with 100% American pure cane sugar and filtered water. Made with premium ingredients, pure cane syrup is specially formulated to dissolve instantly in any hot or cold beverage, for fast convenient use with great taste. Convenient bottle pump included. Pump dispenses a ¼ oz. portion, which delivers the sweetness of a packet of granulated sugar.